How do you get to Carnegie Hall in New York City? Practice, the old joke goes. But not everyone has time for that. As a kid, earning the chance to join an orchestra can be as simple as signing up for music lessons, obtaining access to an instrument and learning sheet music. As an adult, winning a shot at joining an orchestra can take hours, education and the talent to survive an audition. Otherwise, you’re more likely to play in a beer hall than Carnegie. Their experiment began over the summer when Sigitova posted an open invitation on Reddit to informally gauge interest for a new kind of community orchestra – one geared more toward casual musicians who are as interested in the beers after rehearsal as their performances during them. 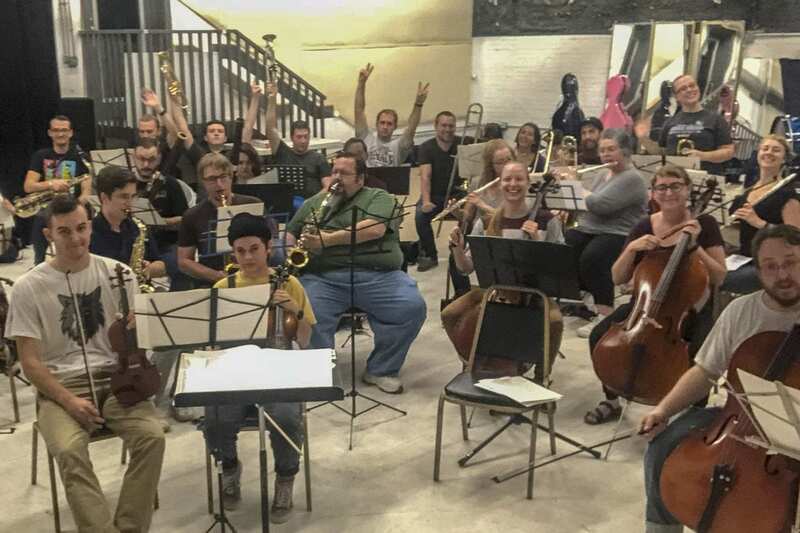 The Reddit post lovingly referred to the would-be ensemble as the “Drunk Orchestra” and sought to realize Sigitova’s stated dream of “bringing crappy musicians together to make fun music.” Based on the initial response, Sigitova organized a community meeting at The Rino on Armour Road last September. Along the way, she asked McDill, who earned a Masters Degree in Orchestral Conducting from Pittsburg State University, if he would be interested in helming the experiment. Sigitova was equally surprised by the level of interest, but it confirmed some of her own theories about musicians in general. If the Reddit comments are any indication, what followed was a lot of tuning, cleaning and the repair of instruments that often had not been unboxed since high school. And after two months of rehearsals, the group is close to having a fully-formed orchestra. McDill said the ensemble is diverse in both age and ability and that the vast majority are not employed in any sort of musical profession. Violinist Cassidy Rae joined the group after hearing about it from friends. She had grown up as first violin in high school and college but fell out of practice following graduation. She had been offered spots in other groups, but she was hesitant to join where the music would be taken too seriously. So the idea of a “Drunk Orchestra” appealed to her. And though she was initially attracted to the group’s social agenda, she has since rekindled a love of working in unison with a group of musicians. Currently, the group is working on a set of holiday music. The longer term goal is to officially register the group as a non-profit and schedule at least two free performances a year. Sigitova and McDill are also hopeful that in much the same way the group has attracted a different type of musician, its performances may attract a different type of audience. The two said this might include writing orchestral versions of contemporary music or working with the community to bring symphonic performances to places where they wouldn’t normally be found. Dan Calderon is Kansas City native, an attorney, and contributor to Flatland. You can contact him by emailing pdancalderon@gmail.com, or on Twitter @dansascity.